It can be tricky to mow the lawn at the right time. I have limited windows of opportunity and when a planned mowing day gets rained out I may have to wait a week before I can get to it again. One time I got rained out, then we went out of town and then I got rained out again. My yard looked like I was making some sort of protest by the time I got a chance to cut it. Aw, Biff, at least now you don’t have to mow! I’m gonna go with “neglecting to do things week”, though Micah’s guess would be pretty amusing as well…. I used to hate mowing my lawn as I was in the same boat. Eventually it would get so bad that the lawnmower just refused to cut grass that tall and I’d have to hike up the lawnmower to it’s tallest setting and then only cut six inches at a time. I really should have just gotten a goat. We know when it’s summer because our backyard has become a dustbowl. We usually manage to coax the grass back into life by April, but this year it looks like we need to lay new stuff. This is definitely “Times Chris Halbeck forgot to do chores for too long and ended up spending far too much time doing them” week. @Drew and Justryan: How do you explain the couches? Yeah, in Minnesota, there are no lawns…only what Biff sees here. 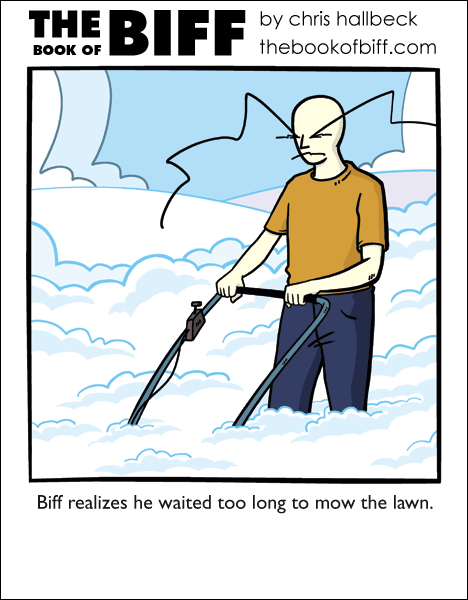 BIFF LIVES IN THE SKY AND IS MOWING HIS CLOUDS. @micah: couches never need an explanation. perhaps he procrastinated on keeping them apart, lol. @Justryan: That’s only when people get turned into them. It’s consequences week and cause and effect week. How…how did Biff get out of his house? after looking at the comic a second time it was funny! First time i thought it was snow, you know being Canadian and all, although right now it is 20 some degrees and raining (we only get snow for 3 months of a year on average). The snow though just did not make sense for mowing the lawn. Raking the leaves on the other hand. Cottage + early start to winter = raking snow (it is terrible for the lawn to leave the leaves on it over winter). Wait a moment here, the USA dose not use Celsius so some of you are probably wondering how it is raining at 12 degrees below friezing, 20 some degrees = somewhere between 68 and 86 degrees Fahrenheit. @Steve-o: Isn’t it obvious? He climbed onto the roof and swung Tarzan-like through the towering blades of grass to his rocket ship and blasted into the heavens, where he realized he forgot his lawnmower, blasted back to his house, blew his mower whistle, and after the mower came dutifully through the garden-grass jungle, blasted back into the clouds, parked his rocket, and proceeded to attack the lawn five inches at a time. I just hope he doesn’t encounter any giants. They tend to live in the sky near colossal vegetation. Today I finally decided to bite the bullet and start making a random comic generator for The Book of Biff, I did 200 comics before i decided to take a break for the night. I currently have a Random Biff button in my navigation toolbar that only accepts the first 200 comics so-far. I was laughing SO hard when I first read this. This one and the one where he tries to jimmy the door lock with the thin crust pizza are two of my favorites. -2! – There’s a random button built in to the software that runs this site. I just need to upgrade to the next point release. There’s a bug in the one I’m running that broke it. I guess thats what happens when my power adaptor glitches out and my computer is running to slow to actually work on my game that I am making (should I ever finish it I will post a link to it). How much longer for this random button? just to tell you Chris, on this specific load, a large banner add appeared in the location of that small square add. -2! – That’s because I put it there. If you want to be able to edit your posts then click the login link at the bottom of the left column and register for an account. May I ask how do I edit. I cannot seam to figure it out! -2! – You have to log in and make a post from that account first. @ Chris unless I did something terribly wrong I am currently logged in as I was when i sent both of those messages. yes! story of my life! Oh God how true this is! Luckily my neighbors are either a)related b)understand or c) are too new to have picked up on that. I’m slightly at a loss, is it that he is mowing the lawn through snow, or that he is in the clouds to get above the lawn to mow? is that snow or grass seed? I’ve done that a time or two.